fits nicely with linens from the Goodwill. SO beautiful Ms. Kate. I just wanna crawl in your lovely bed. Again, I LOVE your linens. I know I say that everytime you show your bed ... but, it's gor-gus!!!!! You have SUCH a gift of mixing neutrals, Kate! I love the fact that you can do it without spending a ton of money, too. :) Your bedroom is just gorgeous! Lovely as always! We just got a Goodwill here in Redding- I remember those days living in Orange being able to hope from one thrift store to another! You are the QUEEN of decorating on a dime Lady Kate! Looking forward to your new design project. I love the combination of weathered wood with fresh whites. I appreciate your lovely style. Your bedroom is so soothing. I just love all your organic touches. Great finds. I can't believe it. I found a similar leather chair curbside, but sold it. It had a taller back. Wish I'd kept it. Gorgeous Kate! !~ I love all of the linens on your bed and the headboard made from recycled wood!!! You always inspire my friend!! It was so awesome to see you the other day!! Take care and have a lovely Wednesday! You and I think alike girl....I love the weathered wood mixed with whites. So soothing!!! All your bedding is beautiful as well. I really like the combination of textures and the whites with the weatherd wood. Beautiful Style! You must feel wonderful every time you walk into the room. Thanks for sharing the lovely everythings! Girl! You got me wanting to makeover the Boudoir! Thanks for the inspiration! I love Rose's pillows, too! Love the twigs at the end of the bed. And the coral is beautiful. Perfect touch for summer, love all the white too. How peaceful and serene. Jackie and I miss seeing you and your family at the fleas. Keep posting, love the wonderful inspiration, that maybe my rooms will someday look as beautiful and cozy as yours. Kate...just spectacular. You do some amazing decorating on the dime. WOW! I'm inspired to tighten my purse strings after reading your post. My favorite of your finds is the luggage rack turned into an end table with glass top. Impressive! What a lovely space, Kate...I love the rustic elements you have introduced into the mix! this room is definitely simple, beautiful and you! I would love to have a relaxing retreat such as yours. This belongs in a magazine spread. So pretty! really beautiful, Kate! well done! :) Love the bleached grays and whites. 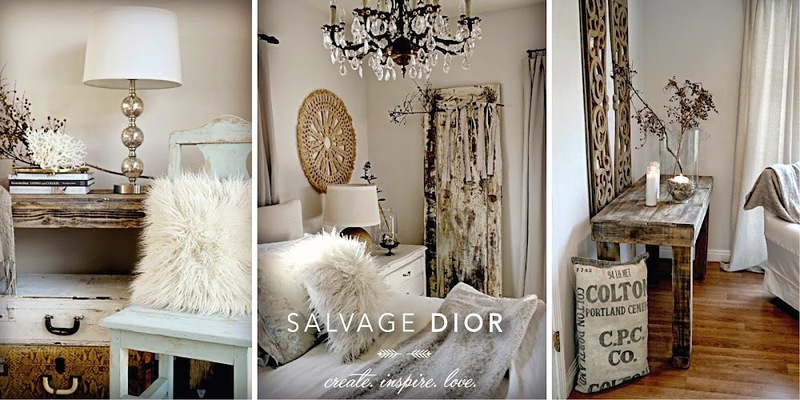 Kate, each time I visit I am inspired and in awe at the beautiful rooms you create with your salvaged finds! I love it all. So beautiful! I just found your link over on Common Ground and I love how you added in the box of twigs--such a great contrast to the white. Kate, your home is so beautiful and serene. A piece of scaffold, now who would have thought? I love the wooden box. I also love mixing old with new, but you do it oh so well! I am loving all the white and thinking I need more. Thanks for sharing with Share Your Cup. love it!!! beautiful combination of awesome finds. miss you my friend. see you in aug or sept. This room is so gorgeous. I love how you used finds in a new way. Love the luggage rack idea. Popped over from Kristin's.